Injuries to pediatric athletes are becoming increasingly common as children compete in more physically demanding sports. These athletic injuries may be acute or as the result of chronic overuse. Acute trauma may lead to damage to tendons, ligaments, and muscles, as well as their bony attachment sites. Infections such as osteomyelitis must also be considered in the differential of pediatric patients presenting with hip or groin pain. This review will discuss the normal muscular attachments to hip physes and physeal equivalents, as well as common injuries and their management. These findings are important to help with the diagnosis and treatment of pediatric patients who present with hip pain. Development of the pediatric pelvis and hip is complex, with multiple apophyses and physeal equivalents. These apophyses are vulnerable to avulsion in the acute and chronic traumatic settings while their associated physeal equivalents are susceptible to infection due to the increased vascularity during pelvic development. Knowledge of the muscular attachments of the pelvis, predispositions for avulsion injuries with certain sports activities, and suspicion for osteomyelitis in the setting of fever are tantamount for the appropriate diagnosis and treatment of pelvic injury or infection. In addition to the normal physis and associated zones, bones may have physeal equivalents or apophyses. These apophyses add to the overall contour of the bone, but do not add significantly to longitudinal growth and serve as muscular attachment sites in the developing child. The pelvis contains several apophyses, including the ischial tuberosity, anterior superior iliac spine (ASIS), anterior inferior iliac spine (AIIS), superior corner of the pubic symphysis, and iliac crest. The lesser and greater trochanter of the femur are also apophyses of the hip, as they serve as muscular attachment sites [Table 1]. These attachment sites are illustrated in [Figure 1] [Table 1]. 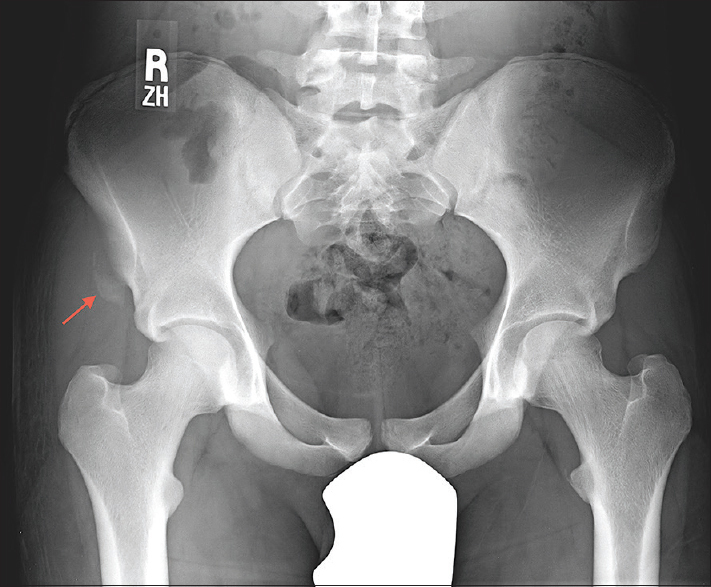 Acute avulsions may present as groin or hip pain depending on the location of the avulsion. The prevalence and locations of the different types of avulsions vary based on several characteristics, including which sports are played by patients. A study by Rossi and Dragoni looked at over 200 cases of avulsion fractures. 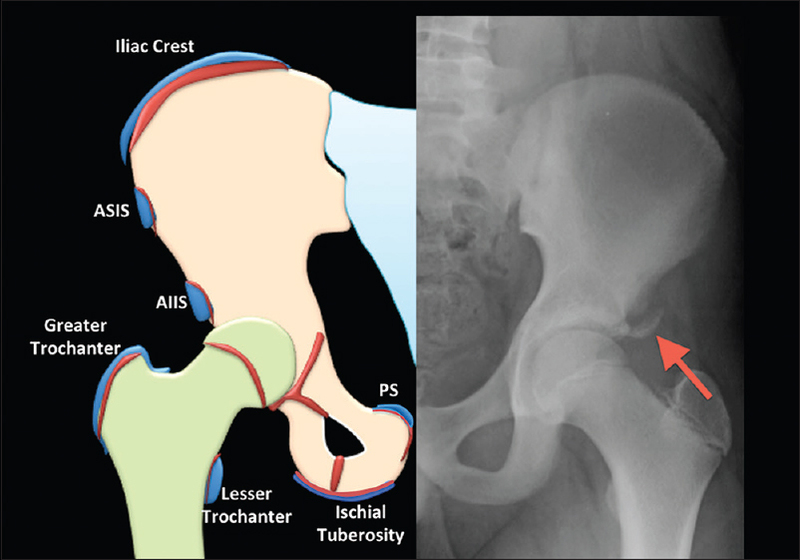 Of the 203 cases analyzed, over half of the acute injuries resulted in fractures of the ischial tuberosity. Forty-five resulted in AIIS injury, compared to 39 ASIS fractures. The least common fractures were the superior corner of the pubic symphysis and iliac crest. 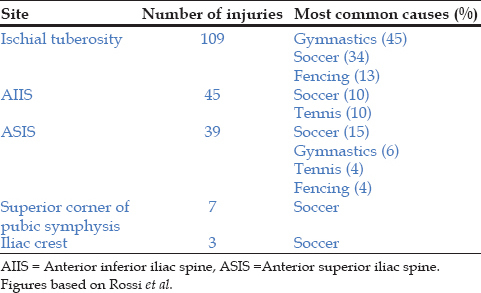 The distribution of injuries also varied by sport type, with gymnastics accounting for the most common cause of ischial tuberosity injuries (45 of 109), followed by soccer (34), and fencing (13). Injuries of the AIIS were most commonly the result of soccer (10 of 45) and tennis (10). ASIS injuries [Figure 2] were most common in patients who played soccer (15 of 39), gymnastics (6), tennis (4), and fencing (4). Soccer accounted for most of the injuries of the superior corner of the pubic symphysis. The findings from Rossi and Dragoni are summarized below in [Table 2]. Chronic trauma, such as repeated insults or a long-standing untreated injury, may cause inflammation. This may be detected as T2 hyperintensity within the apophysis and the physeal equivalent on MRI and termed apophysitis. Frequent microtrauma can lead to avulsions which result in bone formation. In some cases, there may be multiple avulsions in asynchronous stages of healing due to repeated insults of one location. These are generally characteristic of organized sports activities such as cheerleading, sprinting, gymnastics, football, and track. In cases where chronic injury has led to new bone formation, productive bony changes may have an aggressive appearance resembling a neoplastic process or infection. In conclusion, pediatric hip and pelvic pain is a challenging clinical presentation, in part due to the complexity of the developing pediatric hip and pelvis. If musculoskeletal injury or infection is being considered, radiology may be critical to the diagnosis of apophyseal avulsion or physeal equivalent inflammation and infection. Knowledge of the predisposing sports injuries, mechanics, anatomic locations, and imaging appearance on radiographs and cross sectional imaging (particularly MRI) are tantamount to accurate and timely diagnosis. Ecklund K. Magnetic resonance imaging of pediatric musculoskeletal trauma. Top Magn Reson Imaging 2002;13:203-17. Rogers LF, Poznanski AK. Imaging of epiphyseal injuries. Radiology 1994;191:297-308. Jaramillo D, Hoffer FA. Cartilaginous epiphysis and growth plate: Normal and abnormal MR imaging findings. AJR Am J Roentgenol 1992;158:1105-10. Laor T, Jaramillo D. Metaphyseal abnormalities in children: Pathophysiology and radiologic appearance. AJR Am J Roentgenol 1993;161:1029-36. Stevens MA, El-Khoury GY, Kathol MH, Brandser EA, Chow S. Imaging features of avulsion injuries. Radiographics 1999;19:655-72. Rossi F, Dragoni S. Acute avulsion fractures of the pelvis in adolescent competitive athletes: Prevalence, location and sports distribution of 203 cases collected. Skeletal Radiol 2001;30:127-31. Metzmaker JN, Pappas AM. Avulsion fractures of the pelvis. Am J Sports Med 1985;13:349-58. Sundar M, Carty H. Avulsion fractures of the pelvis in children: A report of 32 fractures and their outcome. Skeletal Radiol 1994;23:85-90. Wooten JR, Cross MJ, Holt KW. Avulsion of the ischial apophysis. The case for open reduction and internal fixation. J Bone Joint Surg Br 1990;72:625-7. McKinney BI, Nelson C, Carrion W. Apophyseal avulsion fractures of the hip and pelvis. Orthopedics 2009;32:42. Rajasekhar C, Kumar KS, Bhamra MS. Avulsion fractures of the anterior inferior iliac spine: The case for surgical intervention. Int Orthop 2001;24:364-5. 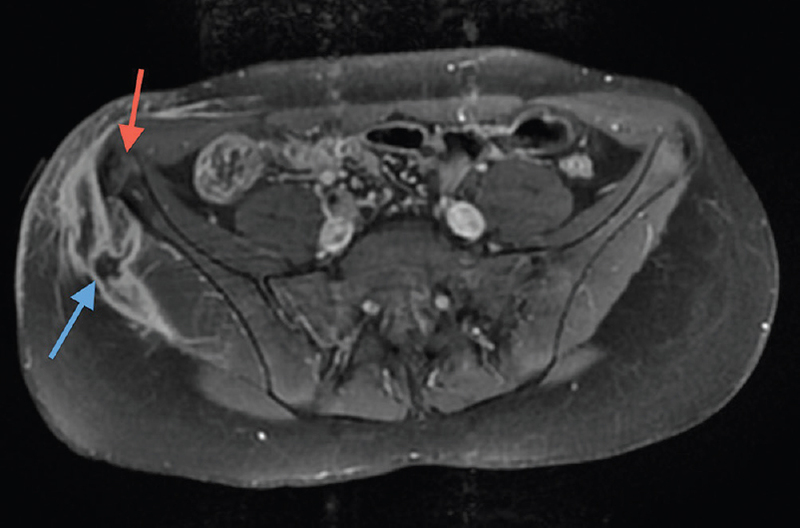 Sturzenbecher A, Braun J, Paris S, Biedermann T, Hamm B, Bollow M. MR imaging of septic sacroiliitis. Skeletal Radiol 2000;29:439-46. Zvulunov A, Gal N, Segev Z. Acute hematogenous osteomyelitis of the pelvis in childhood: Diagnostic clues and pitfalls. Pediatr Emerg Care 2003;19:29-31. Weber-Chrysochoou C, Corti N, Goetschel P, Altermatt S, Huisman TA, Berger C. Pelvic osteomyelitis: A diagnostic challenge in children. J Pediatr Surg 2007;42:553-7. Simpson MB Jr. Pelvic-femoral osteomyelitis complicating Crohn's disease. Am J Gastroenterol 1984;79:379-81. Davidson D, Letts M, Khoshhal K. Pelvic osteomyelitis in children: A comparison of decades from 1980-1989 with 1990-2001. J Pediatr Orthop 2003;23:514-21. Connolly SA, Connolly LP, Drubach LA, Zurakowski D, Jaramillo D. MRI for detection of abscess in acute osteomyelitis of the pelvis in children. AJR Am J Roentgenol 2007;189:867-72. Kumar J, Ramachandran M, Little D, Zenios M. Pelvic osteomyelitis in children. J Pediatr Orthop B 2010;19:38-41.